Speak up! Stand-up! Get involved! Help make history, put your money where your mouth is, support the marijuana legalization initiatives in all three states, Colorado http://www.regulatemarijuana.org/, Oregon www.octa2012.com and Washington http://www.newapproachwa.org. You can also spread the theme song for Colorado prop 64 http://www.regulatemarijuana.org/news/listen-yes-64-theme-song. Each of these initiatives has its strengths and weaknesses, and none of them is perfect, but they certainly are a big step in the right direction and deserve your support. Medical marijuana initiatives are on the November ballot as Question 3 in Massachusetts, and Arkansas. Question 3 has huge lead in the polls. The Arkansas Medical Marijuana Act is under far more pressure, polling at 47/46 and is being challenged by Christian conservatives groups. Arkansas could become the first state in the bible belt conservative South to pass medical MJ, although, admittedly, it is quite a long shot at this stage. Time for Bill Clinton to inhale? The time has come to renew our support for the Guatemalan leading role in drug policy reform. If you haven’t done so yet, please sign the petition: http://signon.org/sign/support-guatemalan-president. Help spread it through social networks and emails. To support a scientific approach to drug policy, please see the Beckley Foundation. The Beckley foundation opened a Guatemala office on July 3rd with the active support of President Otto Perez Molina. The International Drug Policy Consortium (IDPC) is a global network of 82 NGOs and professional networks that specialize in issues related to the production and use of controlled drugs. There are many other organizations well worth your support, such as the Drug Policy Alliance (DPA) and the National Organization for the Reform of Marijuana Laws (NORML), and many others that I do not have space to list here. Feel free to add them in the comment section below. Stay tuned and keep up the fight. Thank you for your support. Become a better informed activist and support global drug policy reform! I do not ask for donations, I invite you to order a book filled with valuable information. If you agree with our views, please share this message to support our cause. Send this message to at least 5 of your friends, post it on social networks, on your blogs, etc. 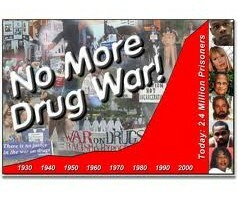 They started the Drug War. Next Next post: Colorado, Oregon, Washington or … Uruguay, who will be first? Obama promise massive drug policy reform … again! Will he deliver this time around? Hosting on As gays rights hit mainstream, what can drug policy activists learn from the gay-rights movement? The Week in Weed 4-6-13 Cannabis News on As gays rights hit mainstream, what can drug policy activists learn from the gay-rights movement? The Best Week in Weed to Date! 11-10-12 Cannabis News on Petition: President Obama, respect the will and state rights of the people of Washington and Colorado!